Ricky Monti "As soon as I left the ramp I knew it was good and that I'd be able to stomp the landing," said Murray following the landing. Footage of Scott Murray's stomped double backflip at the Gladiator Games in Prague over the weekend prompted us to catch up with the rider, who is an anomaly in the world of FMX in almost every way. Murray lives in Perronville, Mich. -- far from the core of the FMX scene in Southern California -- and has never had a financial sponsorship paying his way. He almost never enters traditional freestyle competitions, and doesn't spend much time keeping up with the latest tricks in the sport. 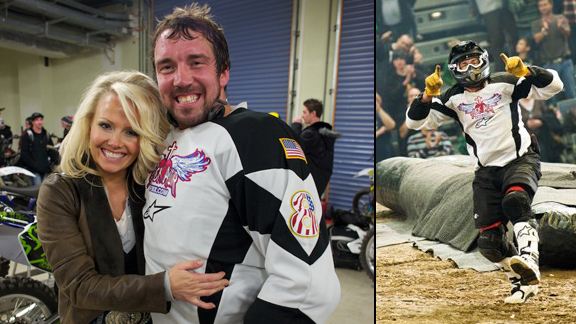 Instead, he says, he's been perfectly content to make a living doing demos around the world and cashing in on his one main claim to fame: six years after Travis Pastrana first landed the double backflip in the Moto X Best Trick competition at X Games, Murray is still one of just four riders in the world who can land the trick. "Travis is still the only one out of all of us who is 100 percent -- I think he's six-for-six now -- and I'm more like 50 percent, so it's not something I'm ever confident with," Murray says. Cam Sinclair has also landed the trick, and has been working on variations like the double nac backflip he won silver with at X Games 17 this summer, and Josh Sheehan double flipped his way to a bronze medal with his first-ever double, but you can still count them on one hand and Murray says it's always a big gamble. "I go to a double backflip show and I look at my numbers and know it's literally a 50-50 chance for me. I'm thinking, 'Am I going to stomp this thing or crash?' It's always very nerve wracking." Ricky Monti/Gladiator Games Scott Murray celebrates after landing his smoothest double backflip to date at the FMX Gladiator Games last Saturday night. Last Saturday, he landed what he says is his cleanest double yet, on a brand new Honda CRF 450 he built in Czech rider Libor Podmol's shop just one week before the event. "The people all stood up and the place went silent," Murray says. "It was the first time I'd done the trick without a song in my headphones, and it was almost creepy because it got very, very quiet. I heard my bike roaring because I was wrapping it out, as I do on the 450, and as soon as I left the ramp I knew it was good and that I'd be able to stomp the landing. The crowd just erupted, and it was a lot of fun." Am I going to stomp this thing or crash?' It's always very nerve wracking. Murray says he's dreamed of flipping and flying through the air since as far back as he can remember, and still recalls the moment when those dreams first shifted from fighter jets to motorcycles. "I've had this infatuation with flying through the air for some reason ever since I was a little, little guy, and it's awesome to be able to chase your dream and live your dream," Murray says. "I just love riding my bike. I don't want to sound corny but & it completes me, in a way, and it makes me happy, and I can't believe I'm so blessed to be able to do this." 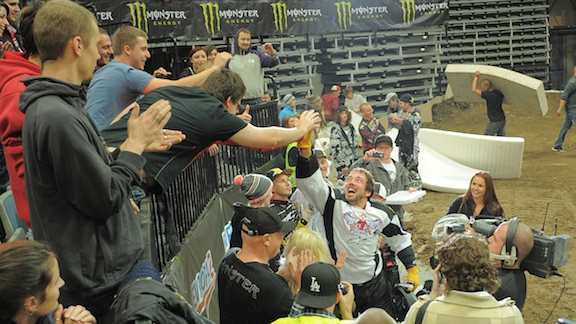 Ricky Monti Murray is congratulated by a sold-out crowd in Prague after capping off the night with a clean double backflip. Although Murray has competed in Best Trick at X Games three times -- in 2007, 2008, and 2009, with five gnarly crashes on double backflip attempts to show for it -- he says he's not big on the freestyle contest scene and prefers to just ride and put on a good show. Still, he was miffed at not getting an invite to compete at X Games this year because he'd been landing his doubles consistently on the the X Pilots World Freestyle Motocross tour; Josh Sheehan got a Best Trick invite despite never having landed the trick before. "No disrespect to Josh, because he's an amazing athlete and I wish I could do half of what he does on a bike, I'm still stumped at that and I'm coming to learn that it can be a little more political these days, especially for someone like me who really isn't sponsored by anybody who has my back and is pushing me in there. But I've made my peace with it: I'm perfectly content with what I'm doing now, being able to travel the world and ride with many of the world's top riders." And while he says it can be stressful to rely on demos (and the double backflip) for his paychecks, he knows he could have it even harder. "There are times when it's very difficult, very stressful and nerve wracking, and you start asking yourself, 'Why am I doing this?' But then I go back and I think about my life before all the freestyle opportunities came about for me, driving pulp trucks and running a chainsaw for a living, and cutting brush. I don't think anybody really dreams of cutting brush or cutting pulp wood in the woods with a chainsaw! That's a lot of hard, backbreaking work, and my family has done that kind of work for generations. To be able to go out and make a living doing what I love to do, riding my bike, it's like I never work a day in my life. I love what I do, and if you're blessed to have that then you've got it made. I wouldn't trade this for the world." 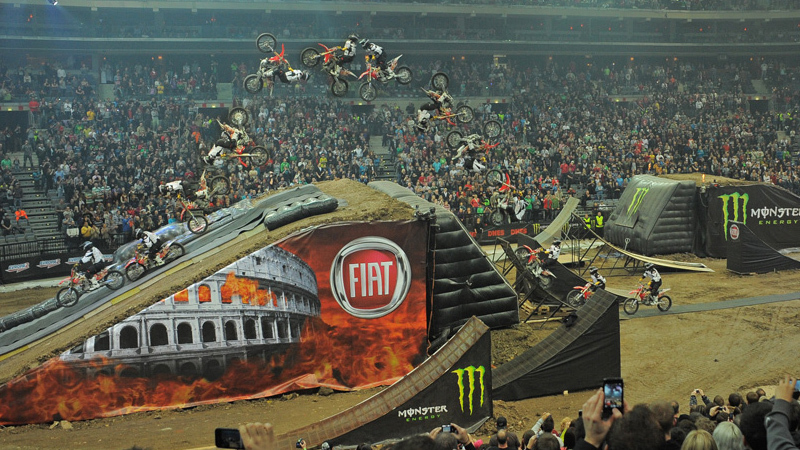 Ricky Monti Murray focuses prior to the FMX Gladiator Games in Prague. This week he's headed for the X Pilots event in Mexico City, where the higher elevation could mean problems getting enough power to his bike to complete the double. "Lord willing I'll be able to stomp this thing and go home in one piece," Murray says. "I've crashed so many of these doubles that I'm almost as comfortable crashing as I am landing them. I do wear a lot of padding on my body, because I know I'm going to hit the ground, and I try to prepare myself and train my body as much as possible." Murray says he's also working on some double variations, and admits he's holding out hope for another turn at X Games. "Don't get me wrong, if I got the invite I would love to get that monkey off my back, but now Cam is doing nac double flips and you know Josh is going to come out with a double variation. Do I see myself getting back there? Maybe, but I'm not holding my breath. I'm a firm believer that the good Lord's going to put me where he wants me. If he wants me at the X Games, well, maybe I'll be there, and if wants me at demos all over the world being a good ambassador for the sport -- and for Him -- then that's what I'll do."